LOST FOR WORDS is a satirical look at a famous literary prize awarded to citizens of the Commonwealth. Don’t let the satire fool you; St. Aubyn’s commentary is biting on every note. 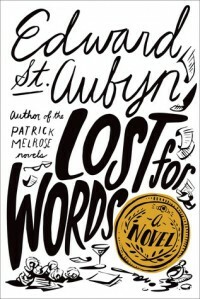 Formerly shortlisted himself for the Man Booker Prize (and already winning the Wodehouse prize for this book), St. Aubyn’s oft-times comical writing provides an incredible insight into this prestiged entry. In this, you may see the humor of a cookbook being submitted to the prize committee by accident, until it becomes an actual contender for the shortlist. Love affairs with editors or committee members? A quick look on the Man Booker’s Wikipedia page may suggest that this isn’t all comedy or even fiction. Before reading this book, you’ll want to take note of the helpful summary provided by the publisher, outlining the three main featured character novelists. My favorite: Sonny, in his imagination of seeing himself paraded through the press as the main contender. Five other characters have predominance as the committee members and chair. As the reader, you’ll be treated to some segments of these fictitious book entries. I love this part. They sound spot-on in their appeal. Take for example, a book from the point of view of William Shakespeare that's a "richly textured portrait of Jacobean London" and is an "ambitious and original novel". Sound like some description you’ve read before? I love the satire of it, but part of me is curious what it’d be like to sit at the pub with Billy Shakespeare. And that’s the meat of this all: to find the understanding of what drives us to read. What’s enjoyable versus what is art—and what may be a bit of both. You’ll appreciate the quirks of both the readers and writers featured in this novel. You may relate to the person looking for books that are well paced, well researched, and vivid throughout. Or, you may laugh at the realistic portrayal of a writer using software that belts out phrases for the punched in simple words. There are so many nuances that St. Aubyn fits in—don’t be deceived by the small-ish book size. Every line serves a purpose or a punchline. Overall, this is a brilliantly constructed novel that pokes fun at and defines what we love about literature. It is art. It is crazy. And we love it so. Thanks to Farrar, Straus and Giroux for sending this book to me for review.